Easter eggs and Easter bunnies. Awwwwww! 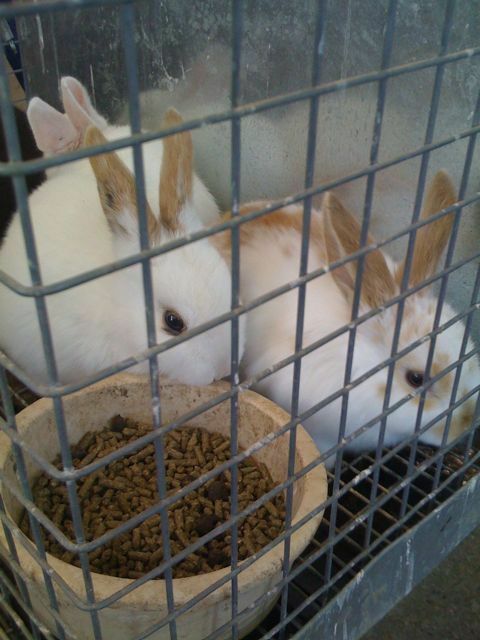 Look at the bunnies! Years ago, ouw 20-year-old cat approached the house making the strangest cry while softly carrying a fluffy baby rabbit in her mouth (she even brought another baby bunny and the cry was for us to look after them, probably because the mother rabbit had been killed by a predator. My wife would come into the room where his cage was and start shredding the carrot and he would pop up from his hiding place and come to get fed. When he was old enough to survive on his own, my wife brought the cage outside and opened the cage door. He hesitated and then hopped out a few feet and then looked at my wife for a few minutes before he hopped into the underbrush. For months afterward, when my wife was working in the garden, a brown bunny with the same scar around his ear would hop up and look at her for minutes at a time and my wife was sure it was “R.B.” her nickname for her furry friend. When my wife was a youngster her collie would help her round up the domestic rabbits when they escaped by gently placing his paw on the rabbit until my wife could pick up the escapee. A few times her collie gently put his paw on a wild baby rabbit, who froze to the ground it was so frightened. Dang. 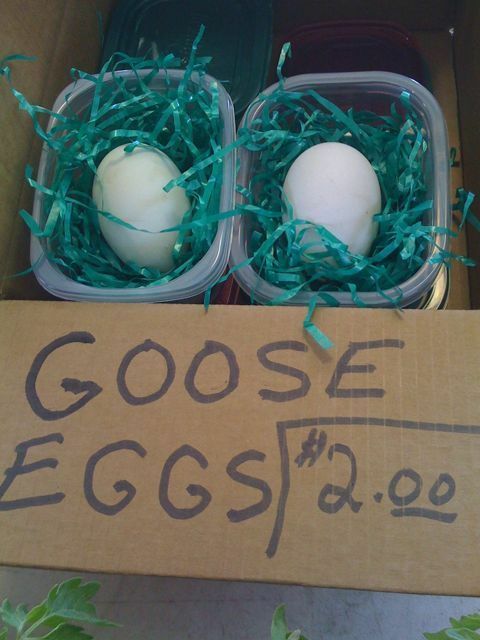 I didn’t know goose eggs went so high. We must have fifty or sixty dollars worth on the kitchen counter. Does anyone else remember begging their parents for baby chicks at Eastertime? These being baby chicks that were dyed in food coloring, different pastel colors. What a mess, as I’m looking back on it with parent eyes. I cannot believe that they gave in. We must’ve been real whiney butts. Bunnies should NOT be given as Easter presents. We ended up with our rescue because the neighbors down the street got tired of taking care of him after 4 months. He hopped around the neighborhood through the winter. We caught him in our backyard in Feb 2005. Named him Killer. He is mostly white. Our cats are scared of him but he loves them. Moe’s baby chicks reference reminded me of our daughter Erin’s Ag class in H.S. Class project was raising some chickens to eatin’ size, and documenting feed, medication, growth rate etc.. When my wife and I had a parent-teacher conference her teacher said that Erin obviously had a sense of humor about the chicks’ fate. She had named them “Rotisserie Gold” and “Nugget”. Ten years later, after a Bachelor’s Degree in Japanese, 4 yrs. working at a law firm, then returning to school for a Master’s in International Relations, she was hired by the USDA! Happy Easter to all from Butler Center, Indiana. My great-grandmother had chickens – with at least one rooster, so in addition to eggs, she occasionally had chicks. When I was three, I got two of them for Easter, not realizing that they were destined to return to my great-grandmother’s. I named them Amos & Andy. I was fond of them, but they quickly outgrew our apartment and had to return to the farm. Young roosters can quickly – and rather audibly – make themselves unwelcome in an apartment. So, off they went to begin their bucolic life on the farm. Months later, after a chicken dinner, I was informed that we had just eaten Amos (it could have been Andy). Not really being a farm kid, I didn’t understand that there aren’t many gigs for roosters on the farm and there were certainly no open spots at my great-grandmother’s place. I’m not sure that I was able to grasp that their position in the henhouse was demonstrably different than all of the other birds. Also, I generally didn’t condone the notion of eating one’s pets. I would have thought that their previous status as a young boy’s pets would have earned them some kind of general amnesty. Sadly, this was not the case. Thus, an innocent young Gasman learned that the world can be a cruel and unforgiving place. That may have been my first push toward becoming a vegetarian. Three cheers for the JSOC “death squad” (that Sy Hersh is sliming, to puff up sales of his next book) that terminated (with extreme prejudice) that piracy event off the coast of Somalia – and to the President of the United States who calmly and cooly weighed his options, and then excercised them. As I (way too) often say to my kids: “It’s the circle of life, folks.” Pardon the Disney reference. Gasman, it might have been better if your grandmother had had pigs, as my grandfather did. There’s something about bacon that puts the sad facts of omnivore life into perspective. brian stouder • whitebeard • coozledad • moe99 • derwood • Dave K. • Gasman • jcburns • Kirk • brian stouder • Hank Stuever • Catherine • and YOU.